With devices like the Oculus Go trying to find a sweet spot between mobile VR and tethered PC virtual reality, Windows MR headsets are trying to find a home that cultivates the opportunities presented by augmented reality in addition to virtual. Windows has teamed up with five headset manufactures to lead the charge with their attempt to bring immersive technology to the masses and four of them are available today. The fifth, by Samsung, is available for pre-order and will be available in November. The Microsoft store includes an app for you to install that will check to make sure your PC is ready for Windows Mixed Reality. After running a check, it will break down all of your components and let you know what will need to be upgraded if you don't pass. The Acer and Lenovo models will set you back $399.99 with Dell and HP available for a bit more at $449.99. 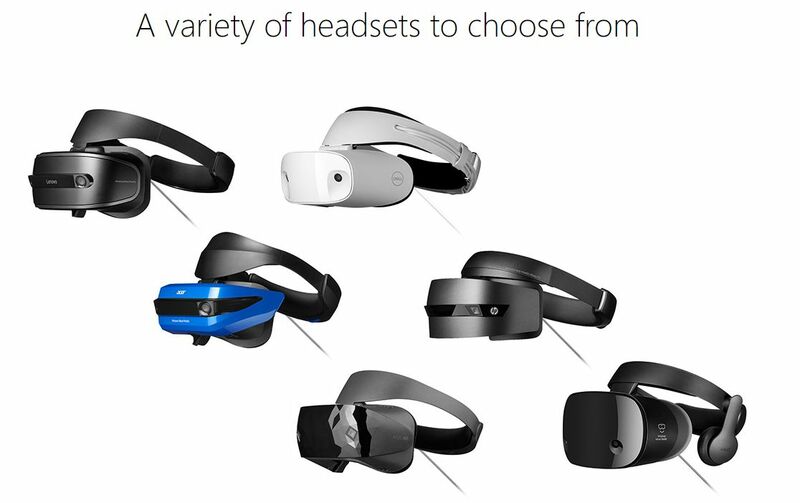 With identical specs, your selection will come down to aesthetic and/or brand preference which is something Microsoft specifically wanted to open the door to with their Mixed Reality initiative. The Samsung HMD, called Odyssey, is available for pre-order at the higher $499 price point and will be available on November 16. Promotional material on the website also includes mock images of the upcoming Windows MR HMD from Asus, but there's no release date or price just yet. Noticeably, these prices match and eclipse the Oculus Rift at its new permanent price point of $399. It is certainly more capable of delivering high-end VR, but with the tradeoff of needing a more powerful PC to run it.